Charles Tyrwhitt’s casual shirts are part of our shirt’s range and more laid-back than our formal shirts, with single cuffs, relaxed collars, and non-iron options to make life a little easier. We use garment washes and peaching to give the material a softer touch, while bolder colours and playful prints deliver a hearty helping of panache that's easily dressed up or down. Looking for something dressier? See our business casual and evening shirts. 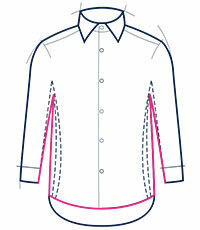 Our Classic fit shirts are cut generously in the shoulders, chest and waist. They have extra long tails at the back so that your shirt will stay tucked in all day. Best for gents with a broad build. Our Slim fit shirts are gently tapered at the waist for a more tailored look. Level tails at the front and back mean you can wear this fit tucked or untucked. Suitable for most shapes and sizes. Our Extra Slim shirts are our closest fit, with slim sleeves, a tapered waist, and a defined silhouette. Great for athletic builds and those who prefer a contemporary fit.